The first eleven minutes of GOLIAD UPRISING are cut together in my editing timeline and GOLIAD UPRISING is beginning to take shape. I jumped into the heart of the film to start the edit, so these 11 minutes aren’t at the beginning of the movie. 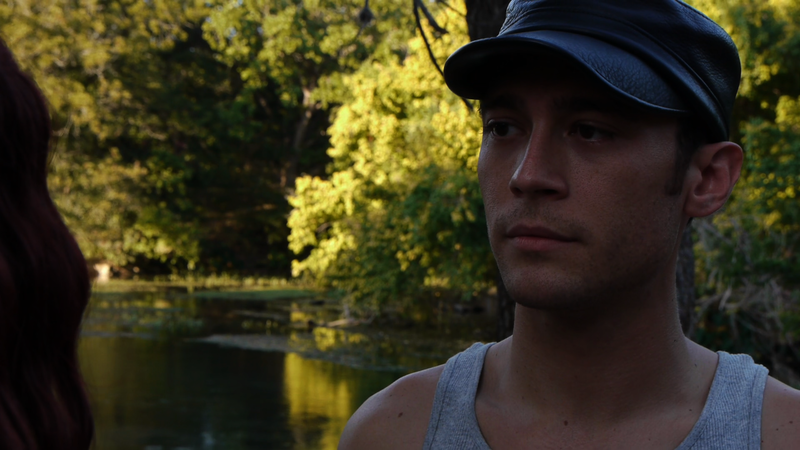 These are the scenes with Ariel (Shannon Lark) and David (Aaron Weisinger) escaping from the police at his apartment, running from the neighborhood with the Austin city skyline in the background, arguing about whether or not David can return to his normal life again while they walk down a back road in the country, and then escaping the police again by jumping in the river and hiding in the brush along the shore. It’s a very fast paced sequence that includes Ariel explaining to David why the new technology is dangerous. These scenes were filmed in two days in both San Marcos (along the river) and in Austin (at Lady Bird Town Lake). The August afternoon heat was well over 100 degrees both days. The only relief for Shannon and Aaron was a brief swim both days. Tomorrow I begin editing the subsequent scene of Ariel taking David to her place and meeting her roommates, who fear the cops will follow. It’s an intense sequence involving SWAT police and a shooting. I will be working on it the rest of the week. In other news, ABRUPT DECISION is now available. Order from me at www.abruptdecision.com for $12. (Or pay $19.95 at Amazon.) I ship via first class mail the day you order (except next week). On Friday I’ll be working in front of the camera for a TV pilot for CBS called “Red Hook” and then working the next 8 days in upstate New York acting in the film VANITAS directed by Paige Campbell.